We are Texas McCombs. And we are #AuditorProud. Today is #AuditorProud Day! And we are honored to celebrate this accounting profession today and every day! Auditors play an important role across the globe, and they truly do make a difference in capital markets. Jeff Johanns, a University of Texas audit lecturer at the McCombs School of Business, shares why he is #AuditorProud and why he chose his career in auditing. Read more from Jeff here. We also celebrated #AuditorProud Day in two audit classes on campus today! Is it coincidence that #AuditorProud Day fell on audit class day? I think not… Thank you, Jeff Johanns, for the amazing #AuditorProud sunglasses! 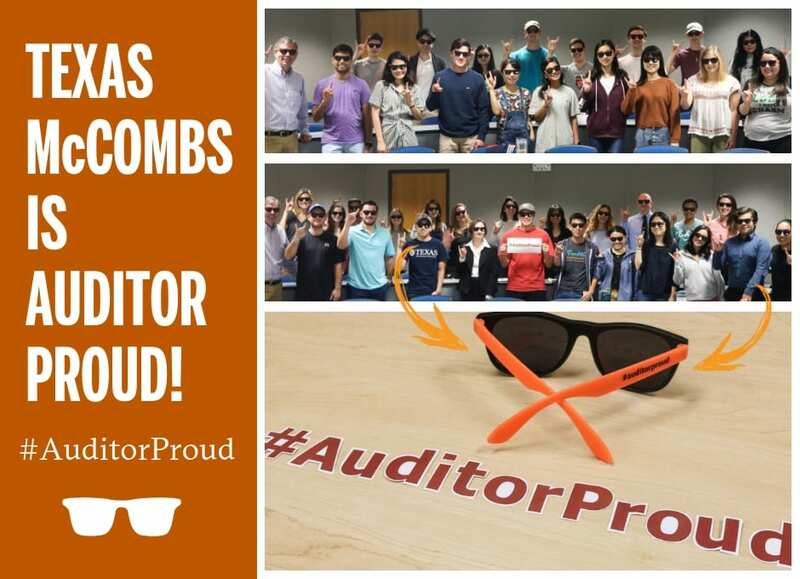 Students from Jeff Johann’s 8:00 a.m. and 9:30 a.m. auditing class show off their new #AuditorProud sunglasses! Take to social media and tell us why you are #AuditorProud or search the hashtag to learn more about the auditing profession.